Partnerships are at the heart of The Limerick Civic Trust, without our corporate and community partnerships, we would not be able to making a lasting contribution to the betterment of Limerick’s environment and the preservation of its history. For over three decades the Limerick Civic Trust has played a key role in Limerick’s heritage and economic development as well as the social and environmental vitality of the region. With the support of our corporate partners the Trust has completed over 150 restoration projects. Our corporate partnerships are essential for the sustainability of our work and enables us to plan for the future. Whether your company would like to support a specific project, or are looking for a strategic relationship, we understand that every company is different and will work with you to tailor a partnership to match your needs and provide a good fit with your core values and staff. There are a number of ways that your organisation, staff and colleagues can partner with the Limerick Civic Trust. Organisations all over Ireland are introducing Charity of the Year programmes as part of their cause related marketing commitments. Choosing a charity of the year is a great way to engage and motivate staff and customers, enhance your organisation and develop customer loyalty and invest in the long term development and enhancement of Limerick. The Limerick Civic Trust will work with your organisation to develop a fundraising, volunteering and promotional strategy for the year. 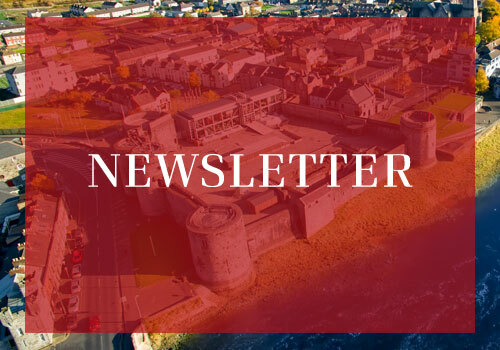 Your company can play a pivotal role in protecting and enhancing Limerick’s unique character and fabric by becoming a corporate member of the Limerick Civic Trust. As a member you will have a vote at our AGM, attend member only events, get priority tickets for events, your logo will be displayed on our website and in our newsletter and receive a number of additional benefits including discounts in a number of Limerick sites, retail shops, bars and hotels. The Limerick Civic Trust hosts a number of fundraising and educational events throughout the year. As we are dedicated to the use of funds raised being used in conservation and environmental projects all over Limerick, we are dependent on company sponsorship to be able to run these events. Autumn Lecture Series: The Autumn Lecture Series takes place every September and October in the unique setting of St Mary’s Cathedral, Limerick. The six-part series of public lectures brings internationally renowned commentators and thought leaders in their field to Limerick. The Limerick Civic Trust are looking for corporate sponsors to enable us to continue to host this wonderful educational event. St. Munchin’s Church Restoration: The Limerick Civic Trust are actively working to restore the historically important St. Munchin’s Church and graveyard. The aim is to use the church as a Local Military Museum commemorating the regiments of Limerick since the siege in 1691 to today. This project will provide a home for a very historically significant collection, which can be preserved and shared with future generations. This museum will be an attraction open and accessible to not just tourists to the region but also the local communities and schools. This in turn will lead to more money circulating in local economies, the preservation, and development of regional identity and more choice for visitors. The Former Exchange Wall: This wall as a key feature of Limerick’s historical and tourist district needs to be preserved with and updated information plague and a general cleaning highlighting inscriptions and effects. The wall could be enhanced as an addition to Nicholas Street by removing the stone fill between the Arches allowing light to flow between the grave yards the street. Clean a Street a Week: The Limerick Civic Trust created this initiative to clean and maintain the city center; the aim is to clean, remove litter, graffiti and chewing gum from one city centre street every week. We are engaging with shop owners, communities and business people generating civic pride in the appearance and upkeep and Limerick. Staff Fundraising: Invite employees to fundraise for the Limerick Civic Trust or to take part in fundraising events in the city like Adare to Survive and The Woman’s Mini Marathon. 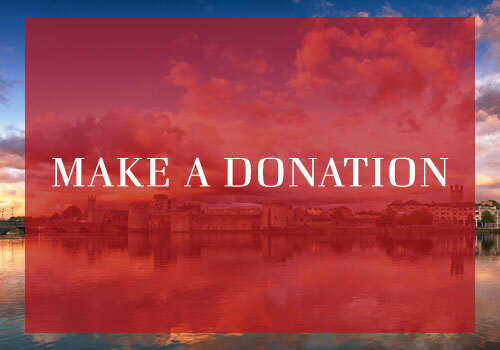 Match Giving: You can encourage employees to fundraise by pledging to match all funds that they raise for the Limerick Civic Trust. Payroll Giving: Members of staff are encouraged to give regularly through a staff fund. Voluntary donations are deducted from your staff members’ salary every week or monthly. Staff members decide how much they wish to donate. Do you have the skills that we need to complete some of our projects? Your organisation could provide your expertise or training to our staff to help us to complete some of our ongoing projects. Offer the Limerick Civic Trust your facilities free of charge to host a fundraising event. Provide products that can be used as raffle or competition prizes. If you chose to partner with the Limerick Civic Trust we will work with you to develop a strategic plan on how we can work together and create a PR and media plan to so that our partnership receives maximum an appropriate exposure.